The movie "Gravity" is an action flick. The space scenes have a real-live space feel, even the astronauts previewing the movie said the space stuff looked incredibly real. Both George Clooney and Sandra Bullock turned in good performances. Just for extra grins, they made the movie in 3D, like Avatar but with real flesh-and-blood actors. As real as the rest looked, it may well have been as computer-generated as the dinosaurs in "Jurassic Park." I happen to be a 3D-hound with my own pair of red-green anaglyph glasses. While I enjoyed the movie, it isn't more than it is. Just as "Star Wars" was a shoot-'em-up western in space, this is kind of like an Indiana Jones wild ride with a background of our blue planet, the stars, and other heavenly bodies, not to mention Sandra Bullock. Each threat comes right on the heels of the last one, no time for the heavy breathing to stop. 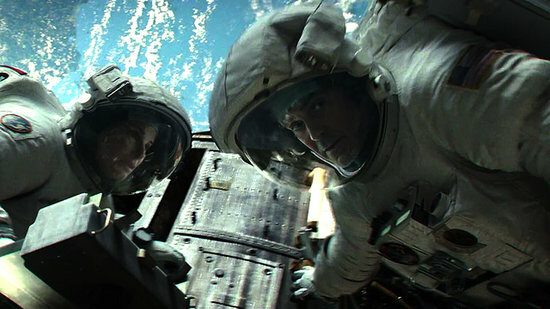 Alfonso Cuarsón directs George Clooney as Matt Kowalsky and Sandra Bullock as Dr. Ryan Stone, space-shuttle astronauts working on the Hubble Telescope when a shower of debris from a destroyed satellite tears up their work, their ship-mates, the shuttle, and any reasonable chance of getting home to the surface of the blue-planet beneath them. Things happen fast, things move fast, things hit other things fast. She and we can see things coming, bad things like debris flying in orbit around the earth and good things like rescue opportunities in Russian and Chinese space stations. Remember "2001: A Space Odyssey"? In particular, remember the space-walk scenes? Everybody and everything moves very slowly and carefully because of the consequences of making a mistake in space. In this movie things in zero-gravity happen fast. In real space astronauts follow specific, careful procedures. In the movie "Armegeddon" it's like cowboys-and-Indians in the wild west without any guns. People fly spaceships crashing into things, nobody bothers with any kind of protocol, they just wing it anywhere and everywhere. There's a lot of that here. Here's my other beef: distances and speeds are larger in space. When we're driving or flying at 300 Km/hour (180 miles per hour), see can "see-and-avoid" other traffic, maybe. Orbital speed is one-hundred times faster, 30000 Km/hour (18000 MPH). Are you really going to see debris coming at you at speeds like that? That's ten times faster than the muzzle speed of a rifle bullet. The Russian and Chinese space stations are close enough to see. If I pick two random spots on the earth's surface, then what is the likelihood you can see one from the other? The odds aren't much better in low-earth orbit. That's a pretty-big coincidence, isn't it? Also, I don't think orbital physics are as simple as aiming for a spot 100 Km (62 miles) away and hitting the rockets-thrust button. I could be wrong on that, but it strikes me that it's going to take enough minutes to get there that it's not just a matter of pushing in the right direction. It takes some complicated mathematical computations in orbital mechanics to figure out how to meet something in orbit half an hour in the future. Another physics fumble is the forces on weightless things. A critical plot point was that Matt and Ryan were pulled apart hard enough that she would have become untethered from her only hope of a ride down to earth. What was creating all that force? They weren't spinning around or anything like that. There are other scenes where people were pulled in various ways by some kind of gravitational forces that don't apply when we're floating weightless in space. 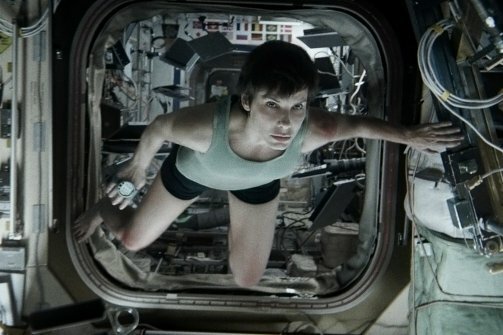 Was "Gravity" deep or realistic? Not really. Was the 3D effect used effectively? It worked well for me. Was it a fun movie? Sure it was. 4:58:24 Mountain Standard Time (MST). 3858 visits to this web page.